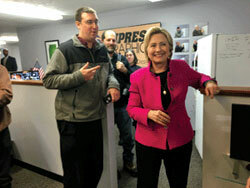 Daymond Steer, a reporter for The Conway Daily Sun, a free daily newspaper in Conway, New Hampshire, says Hillary Clinton stopped by to join their editorial board meeting last week. At the end of the meeting, Steer asked a few questions about UFOs. Steers then asked for a comment regarding statements on UFOs made by her husband, Bill Clinton, on an April, 2014 appearance on Jimmy Kimmel Live! Bill then went on to describe how he looked into the alleged crash of a UFO in Roswell, New Mexico in 1947 and into the legends of alien spacecraft being secreted away to the mysterious Area 51 base in Nevada. In both cases, he says he found nothing of interest. However, when asked about these questions in the past he has added the caveat that there may be career bureaucrats keeping secrets even from presidents. I did try to find out if there were any secret documents that reveal things, and if there were, they were concealed from me too. I wouldn’t be the first president that underlings have lied to, or that career bureaucrats have waited out. But there may be some career person sitting around somewhere hiding these dark secrets even from elected presidents, but if so, they successfully alluded me, and I am almost embarrassed to tell you I did try to find out. According to Steers, she also says she will look into Area 51, although she called it Area 54 before later correcting herself. 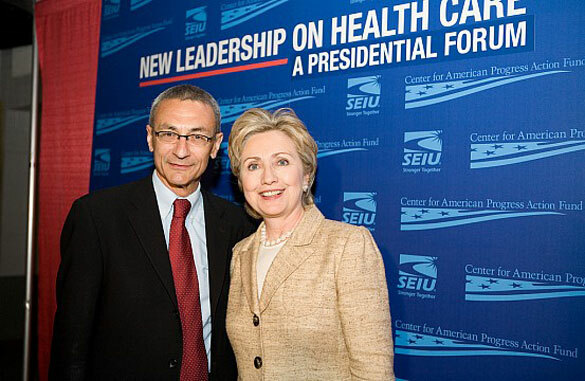 Hillary also mentioned the UFO interests of the chairman of her campaign, John Podesta, who also served as Bill’s chief of staff, and was a counselor to President Obama. This tweet received quite a bit of media attention, including a response from Hillary’s, at the time, “non-campaign” – this was prior to the announcement of her official bid for presidency. 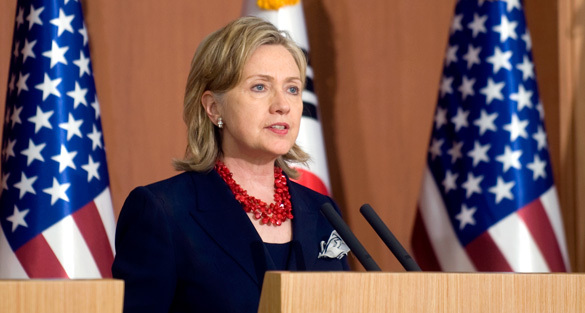 Newsmagazine Mother Jones wrote an article about Hillary and UFOs in April, 2015. In it, they included the response they received when they asked Hillary’s people about Podesta’s tweet. All of these comments from the Clintons and their staff have excited UFO researchers. Some of whom believe that the current government, or a possible future Clinton administration, may be ready to reveal what they know about extraterrestrials visiting earth. That is, assuming that previous official statements about UFOs and extraterrestrial life are lies covering up a cosmic conspiracy. However, others believe that although the Clintons and some of their staffers may have an interests in UFOs, their comments are made in jest. In a Huffington Post story on the recent comments made by Hillary, Steers told Huffington Post reporter Lee Speigel via email that he thought Hillary was “just having fun” and the conversion was light-hearted. Donald Trump may be the candidate in the spotlight for most of the mainstream media, but it is stories like this that are keeping UFO enthusiasts at the edge of their seats with anticipation for what the Clinton camp will do next. We should consider that the Director of MUFON may know 1,000-times more about UFOs than does the President of the United States. The archives of MUFON may hold 1,000-times more UFO information than do all of our government agencies. There may not be a great government cover-up and conspiracy – no bodies at Area 51 and so forth. The USAF Blue Book fiasco proved that uniformed, regimented military personnel are anathema to investigating scientific phenomena. E = MC2 was not discovered on battleship row. Interested and independent civilian researchers have advanced human knowledge and scientific discovery the most. A need exists for government contracts to fund civilian UFO research. Forget the Area 51 conspiracy theory crap and get serious about building some real high-tech instruments. One method to get universities interested in abduction research is to offer them some government contracts to do it. This should be the direction for our elected representatives. In addition to funding abduction research, the government might contract some passive radar systems. These would consist of receivers keying off reflected radio signals, so as not to alert the UFO. Then a “Gatling Gun” battery of every radiation device available would scan it. We have been in the “light in the sky” mode for 70-years, and the cellphone “pictures” phase for 10-years. It is past time to elevate to the next level. Ok , so it is true that we have uncorrelated Targets moving into and out of our airspace. But its not true that WE the GOV-MENT know what these are. We have tried without success to find out what they are and where they come from, WE as a GOV-MENT cannot admit this to the public. Anybody with common sense can tell you that since the Roswell alien spacecraft crash of 1947, we have had an absolute explosion in the rate of of our technological achievements. No,no this is NOT just coincidental. It is all due to BACKWARD ENGINEERING of the downed crashed alien spacecraft in Roswell New Mexico in 1947.The very 1st Newspapers out reported the true and correct information of it being a flying saucer,an alien craft. The preceding newspaper must have had our government officials untrue version put into it as now it was now longer a flying saucer that was spotted and crashed but it was just a military’s weather balloon .Yes the Great Government Cover-Ups Began…Just think prior to 1947 technology wise, we were just beginning to have frame to frame video’s of rudimentary quality.NO WE DIDN’T have any communication system at all like the internet.No TV’s as of yet.I could really go on and on with all the great many things we didn’t have prior to 1947. But how about I just name a lot of the Great Marvelous things we have acquired due to our backward engineering of that crashed alien spacecraft from Roswell New Mexico. Well here goes: #1)- Fiber Optics ……Cool man you Know what those are don’t you ? You probably haven’t seen them for a while but they use to sell them as a type of mood lamp in these chic shops that sold items as black lights and 3D Pictures. Basically fiber optics is just glass wiring .That’s all. Wiring made of glass. Yes now you may remember the many strands of colorless wires that were basically just stuck into the base of a lamp. But Oh my when you turned the light on,the light somehow went from the base of the wiring,to the end of it’s tips. And to top it off, it magically kept changing colors.Okay it was being sold to the public for use as a mood lighting. But FIBER OPTICS has a much more important use. Oh YES a very much more important use. We now use Fiber Optics everyday ourselves in our up to date cable TV and communication systems.It transfers NOT electricity but Communication Signals in an ultra efficient manner….Please take a second to digress– (Just think and picture in your mind an alien spacecraft. A flying saucer out in darkness of space. Somehow your are able to use ESP to see inside the craft. And now you look even further to behind the ships walls and you see it’s wiring . Now what would you expect to see there -CHOICE #A –Fiber Optics (glass wiring,Light not heavy,takes up less room then metal wiring) Or CHOICE # B–A Wide Variety of all types of metal wiring. Bulky and heavy.) Of course an alien craft would have all FIBER OPTICS throughout for efficiency and definitely it would be a weight saver over metal wiring.Okay, Okay enough with the Fiber optics Let me just go ahead and name a list of great many other achievements and then explain some of them. #2)–Night Vision. #3)–Inter-grated Circuits #4)–Nano Technology #5)– Table top or home computers. Laptop computers. #6)–Super computers #7)–A.I. Or Artificial Intelligence #8)–3D Printers #9)–The Great World Wide Communication System –The Internet #10)–Cell Phones #11)– Large Flat Screen Ultra 4K HDTV’s #12)–Compact and DVD Disc Well you get the idea . .All of these items seem to have been springing up from nowhere one after the other. That didn’t happen in the past, not ever at this miraculous pace.NO SIR.I Really do believe that area 51 or other locations have alien craft and that we have been in and still right at this very time are in communication with aliens from all different parts of the universe. ……..I Got to say one thing though. Hillary Clinton has got my vote for her to become President of our Great Country The United States Of America. Although I would really love for her and John Podesta to be able to uncover the truth once and for all about area 51 and all the rest of the alien cover-ups and divulge it to the public. I really DO THINK they WILL find the truth about area 51 and the rest of the alien cover-ups and that AREA 51 DOES INDEED HAVE ALIEN ARTIFACTS AND DOWNED SPACECRAFT FROM THE Roswell New Mexico spacehip crash of 1947……But even though they have gained knowledgGe of the Truth about Area 51 Finally Once and for all. THEY WILL HAVE TO TAKE A PLEDGE TO SWEAR THAT UNDER NO CIRCUMSTANCES AT ALL. NONE!!! THEY WILL SWEAR TO THEIR VERY LIVES TO SAY THAT AREA 51 OR ANY OTHER GOVERNMENT BASES TO THEIR KNOWLEDGE DOESN’T HAVE ANY KIND OF ALIEN SPACECRAFTS. …They will have to become part of the Government alien cover-up…..Here’s Why—Just think say if we were far enough along to finally attempt interstellar travel (Traveling outside our galaxy) We would need a truly revolutionary and advanced propulsion system to power our spacecraft. An advanced propulsion system although it was only meant to only be used for good purposes of powering the spacecraft, could possibly broken down and turned into a weapon unlike anything any human being has seen before.Yes a weapon of grand destruction….So perhaps they, the Government officials at Area 51 ….know the capabilities of turning that propulsion system of that downed spacecraft from Area 51 into a Weapon That may be able to destroy the EARTH…..So they CANNOT NO WAY let screwballs like the leaders of Iran or North Korea or ISIS get a hold something like that. NO WAY. NO HOW!!! So as much as I like to know about area 51 I can see why they would need to keep it a secret.